I often hear moms lament the amount of time their kids spend on 'screen time'. I worry about it too. But, now that TJ is getting older, I am actually learning to embrace some of that screen time. Middle school is a great time to address homeschooling with technology. IPads, laptops, E-readers, and other devices can be very useful for teaching middle school kids to work independently. Instead of lamenting kids and their screen time, let's put those screens to good use. 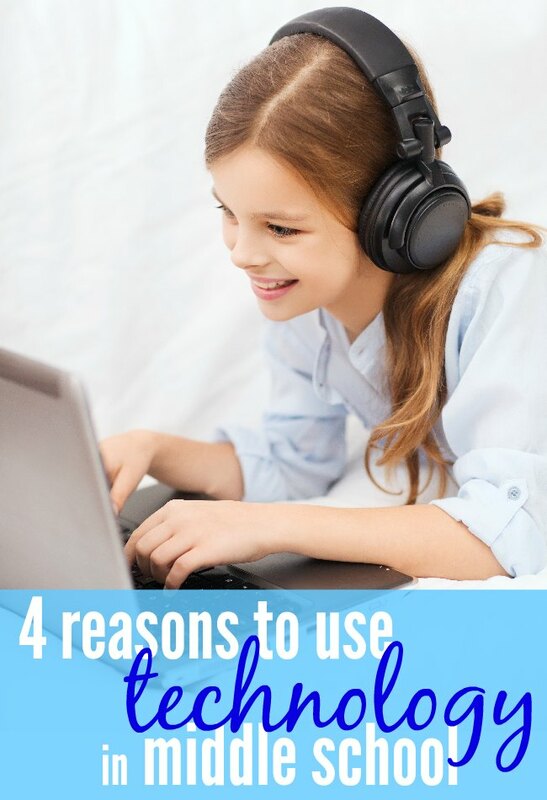 Here are four reasons I'm homeschooling with technology. There are some great apps & websites! There really are so many great websites and educational apps available. We've used some great ones, some good ones, and we've discovered lots of duds. I do have a few things I consider when I'm thinking about incorporating an app or online tool into our daily school routine. What do I look for? and don't forget great resources like Netflix & YouTube! Be choosy and find the things that will fit your family and actually teach valuable skills. It's important to teach basic word processing programs, typing skills, how to use a web browser, and even how to keep a laptop in good condition. In this day and age, these skills are necessary. By incorporating some a few 'screen time' sessions each week in the middle school years you can naturally teach these skills. Middle school is a great time to outsource a class or two, especially if you are planning to outsource any high school classes in the future. Kids learn important skills about learning and time management when mom isn't reminding them to do their assignments. Online classes are a great tool for teaching kids to be more independent. I am planning to have TJ use online classes for upper-level math (and possibly science) so, to prepare for that, I'm having her take one or two classes this year. While not strictly necessary, it's more like a 'trial run' so she'll know what to expect for those future classes, when grades and credits will count. As technology advances, we have to learn to keep up with it. Homeschooling gives our children the opportunity to really dive into technology - they can learn to code, create their own games or apps - the ideas are really endless. Middle school is a great time to encourage this kind of independent learning and creative thinking. Who knows? It could lead to many future employment opportunities. Homeschooling with technology can be a valuable tool. Homeschooling takes a lot of time and effort (years of it, in fact!). It's natural to think that you have to teach every subject and do it all, but that really doesn't have to be the case. By using available tools and technology you can free up your time to study and prepare for those subjects you do plan to tackle in the high school years. How are you homeschooling with technology? Find more ways to use technology in your homeschool with the iHomeschool Network.